Common Figwort, derived from the Genus name, Scrophularia, comes from the plant's traditional use as a remedy for scrofula, an infection of the lymph nodes in the neck. This use is due to the resemblance of the bulbous shape of the plant's rhizomes to swollen glands. It is considered to be a good diuretic and a "blood cleanser" that also acts as a mild laxative and an analgesic. It has also been used in combination with the herb Yellow Dock for chronic skin diseases and as a liver detoxifier. This herbal tincture is also believed to have a stimulating effect on the liver, heart and blood circulation. Everyone needs to cleanse the lymph system of all the wastes that are built up over a lifetime. Cleansing the lymph helps the body to cleanse every organ and system that you have. Today, our bodies are often inundated with unwelcome toxins that can block the lymph nodes, decreasing the body's ability to resist disease. Figwort is among the most useful herbs for the lymphatic system, especially the lymph nodes in the neck. 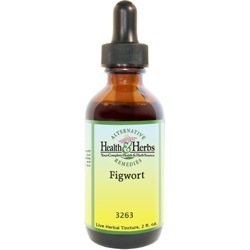 Figwort is said to have an effect on the entire body. Figwort has been traditionally recognized as being a potent diuretic and detoxifier to help cleanse the system and eliminate wastes from the kidneys. It is known as a cleansing herb and has been paired with salt as a tonic for the body's 'yin' energy. It has helped to soothe the digestive system by providing hormone-like substances into the body and has been said to have a stimulating and strengthening effect on the bladder and kidneys. Figwort has been used to stimulate the blood and circulatory system. It is considered to be a cardio-active herb, which is thought to stimulate and strengthen the heart, as well as slow the heartbeat, and as such, should be used with caution. Figwort has been used for circulatory disorders, varicose veins, toothache and high blood pressure. The glycosides it contains make it suitable for treating mild heart conditions that call for stimulating the metabolism and eliminating water retention in the body. For this purpose, the tincture is recommended. Figwort herb has been primarily used for its cleansing and detoxifying properties, for its stimulating properties. Figwort is often used externally for chronic skin diseases such as eczema and psoriasis and also to treat the itching and swelling of hemorrhoids. Figwort liquid extract may help to expedite the healing of burns and as a treatment for ulcers of the skin. In some parts of Europe, it is believed to possess anti-tumor capabilities. It is also an effective medication for such skin ailments as wounds, rashes, boils, scratches, sprains, swellings, bruises and some fungal conditions. It has also been applied externally to certain types of cancer and painful tumors. Interactions: No known drug interactions. Ingredients: Figwort, Structured Water, 20% Alcohol. Non-Alcohol: Figwort, Structured Water, Vegetable Glycerin. Contraindications: Pregnant and nursing women should avoid Figwort. People with heart conditions should not use it without first consulting a physician because it contains a cardioactive substance. Since Figwort may interfere with the absorption of nutrients, it is advisable not to take it with meals. It is also advisable to use this herb under the supervision of a qualified practitioner.